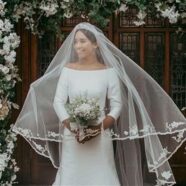 When Megan Markle and Prince Harry tied the knot on May 19, 2018 in St George’s chapel at Windsor Castle in England, everyone in Europe and most everyone across the pond, here in the USA, tuned in by television or computer to check out the details of Megan’s wedding dress. It’s a royal tradition to keep the dress details secret to the last minute! Megan, like many other brides chose to have two wedding dresses, a more formal one for the wedding ceremony and a more relaxed gown for the reception and dancing. Megan Markle reception wedding gown replica. Original designed by Stella McCartney and replica created by Shauna Fay. 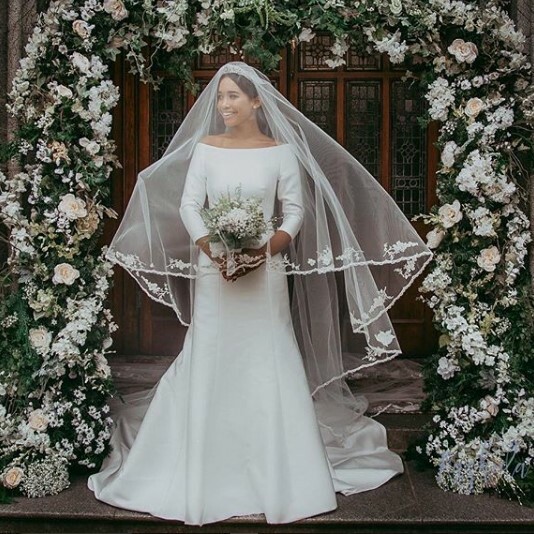 Designed by Clare Waight Keller, Megan’s formal wedding dress for the ceremony itself surprised everyone with it’s simplicity. Made of silk, Megan’s wedding gown had a boat neck and three quarter sleeves, and a trumpet style skirt that flared just below the hips. It was modest, elegant and sophisticated and the royal bride looked stunning in it. Later in the day, Megan changed into her second wedding dress designed by Stella McCartney. Also, quite form fitting, Megan’s reception wedding dress had a high neck, with bare shoulders. Although it had a less formal look, it may actually be more flattering to Megan’s figure and perhaps show off her style as well. As predicted, within a couple of days copies of Megan’s wedding dress are emerging. Designer Shauna Fay from Ireland had perfect replicas made and modeled right away. Her Pinterest page shows the beautiful gowns she created, practically overnight. The photos below and beside this article are from her quick creations. 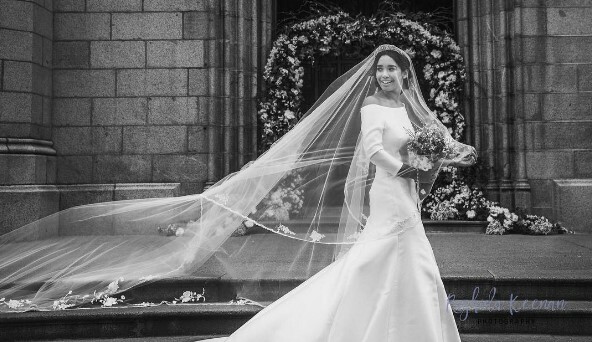 Megan Markle wedding dress replica. Original designed by Clare Waight Keller , and replica created by Shauna Fay. Note the three quarter sleeves and trumpet style skirt of Megan Markle wedding dress replica by Shauna Fay. If your budget is tight, but you love Megan Markle’s wedding dress, you may find wedding gowns with similar details for a very tiny budget. We found two gowns very reminiscent of Megan’s gown, both under $200. Both have similar neckline’s to Megan Markle’s wedding dress, and both have a trumpet style skirt flaring just below the hip. These gowns are different than Megan’s gown, in that both of these wedding dresses are sleeveless. If you want to recreate Megan’s look, just buy two of these gowns and have a seamstress add sleeves! At these prices, you could probably do it! This very affordable wedding dress has similar neckline and skirt style to Megan Markle’s. 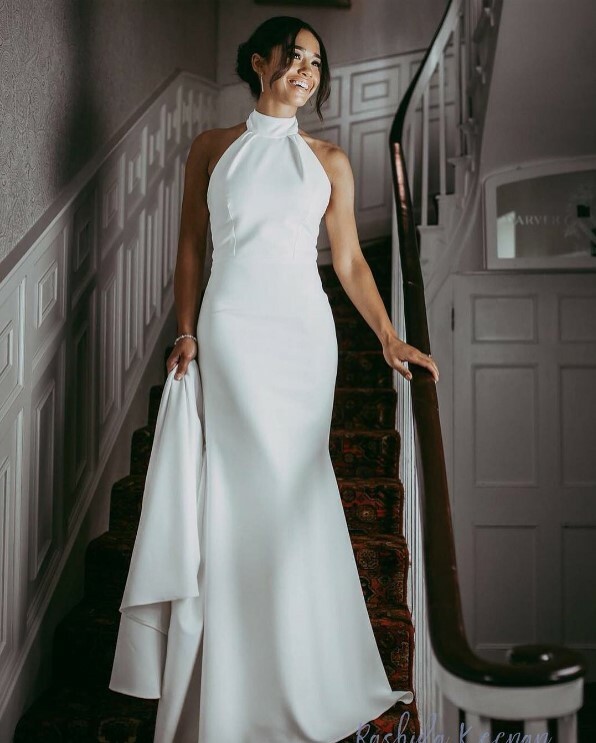 Another sleeveless and also very affordable wedding dress with similar neckline and skirt style to Megan Markle’s. The next question is how will Megan Markle have her royal wedding dress preserved? Because it is silk it will require more expert cleaning than a synthetic gown. Of course, the long train dragged behind Megan as she walked down the aisle. Long trains are like great big dry mops, cleaning everything in it’s path. And silk is a very absorbent fiber. The royal family will no doubt procure the very best cleaning for her gown. Preservation will be done by the experts as well. In 2014, I visited London’s wedding dress exhibit at the Victoria and Albert museum and had the opportunity of interviewing the curator of the exhibit. Enjoy learning more about expert garment preservation when you watch these videos. Do you have a treasured wedding dress or other heirloom garment? Get a Free Quote for your wedding dress preservation!